Also, this year, I decided to spend more time exploring the other show venues here. In particular, the Coliseum Show, the Denver Expo and the Quality Inn show across the street from Marty Zinn's show at the Ramada Inn. I am glad I did it. The Coliseum show is definitely worth visiting if you're a mineral person. The other two are not as engaging for minerals. The tents outside the Coliseum Show. A lot more inside to see too! A view inside the booth area of Mex Min - a company specializing in Mexican minerals. Inside the Coliseum I found Min Mex - a compay which specialized in Mexican Minerals. Their emphasis is on minerals from the Milpillas mine. I spent considerable time and money checking out what they had and came away with a very nice diverse group of Milpillas specimens. Most recently olivenite has been found at the mine. What's next for this remakable locality??? An exceptional group of lustrous cuprite crystals. The specimen is 3 x 2 cm. A specimen nearly covered with light blue baryte crystals. Flat lying crystals of olivenite set on clay altered rhyolite. Thick interconnected crystals of brochantite comprise this 5+ cm specimen. About a 1/4 mile from the Coliseum Show we found the Denver Expo show. This one was filled with a lot of lapidary and ornamental stuff. A few agates but not much in the way of minerals. There was one dealer who had some nice Elmwood mine calcites and I bought one from them however. Jim's Gems had a lot of material from the Elmwood mine. I found one fine calcite specimen I could work with. The bulk of what can be found at the Denver Expo show. Ronna and I spent another day checking out the Quality Inn Show which is across the street from Marty Zinn's Show at the Ramada Inn. memo to self: Since I collect and sell minerals there is no real need to go back to this show. I saw only two dealers selling minerals - New Era Gems and Gem Cutters. The entrance to the Quality Inn. Some of the tents. The only minerals of note are quartz crystals. JG&M had a large "tent" set up in the back of the Quality Inn. Steve Ulatowski of New Era Gems was there though and I did find some interesting things with him including specimens of native gold from the new find at Serra de Caldeirao, Mato Grosso State, Brazil. The degree of crystallization is INCREDIBLE with these things. I also selected several specimens of well crystallized pyrite from the Merelani Hills in Tanzania. Two of the golds I picked up from Steve. you can get a better sense of these by playing the video below. Specimen of pyrite from Tanzania. The big news this year from Denver was the remarkable new colored elbaites from MOROCCO presented by Spirifer Minerals at the Marriott. The precise locality is not being given at this time as it would create a stampede of local diggers to the site and create endless problems. It is Morocco afterall and mining laws and regulations are nonexistent. The locality being given for now is: Ouarzazate Province, Anti-Atlas, Souss-Massa-Draa Region, Morocco. When I was in Poland this past July for Crystal Days in Lwowek Slaski, Tom Praszkier showed them to me. Of course I wanted to get some from him but he said it was all hush hush until the Denver Show. I promised to keep my mouth shut too as I was certain this would be the big news at the Denver show. When he finally made them avaiable I did not waste anytime on the 14th of September and was first in line to secure a quantity of these for the web. One of two cases filled with the new elbaites. The "Accident Piece". See the sign below. One of the better cabinest sized specimens available. Yup, $21,000 is what it says. The second find with very cool color zoning at the terminations. Additional specimens in the second case. One of the single crystals I purchaed from Tom. 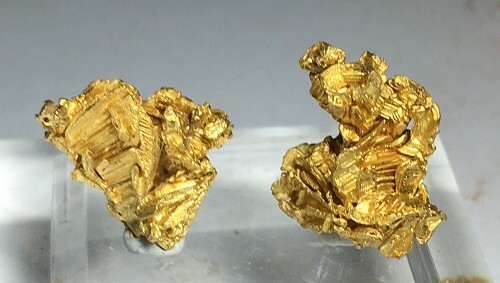 A matrix specimen I purchased. A fine crystal of microcline with two doubly terminated elbaites. Another matrix specimen I picked up from Tom. I purchased 21 specimens in all and will have them posted in the next few days. Show times are also times for friends to get together and spin tales and catch up. A couple of good souls - Dave Crawford and Paul Pohwat at the Main Shows. A shot of Heckle and Jeckle polluting the air at the Marriott. Sorry Herb, we're giving your hat a bad reputation. The rolling bar was also sighted at the Marriott. From left to right - JV, Rod Tyson, John White and barkeep Tony Potucek. Speaking of the Marriott, Evan Jones showed me some new specimens of Moroccan vanadinite with unusual chatoyancy. The color is brownish red but the silky luster if quite different. Also, the crystal habit is unusal with the stepped crystals. Bob & Lisa Williamson also had some of these at the main show. Specimen of vanadinite from Morocco. Alfredo Petrov at the main show had a new find of wurtzite from teh Huanzala mine, Dos de Mayo Province, Huanuco Dept., Peru.. The steel gray wurtzite is found as interlocking hexagonal plates. The matrix is predominantly crystalline pyrite. I bought all except for one of them. Specimen of wurtzite from the Huanzala mine. Steve Perry, from Davis, California, has long been a productive field collector. Almost two years ago he was at the Reward mine in Inyo County, California and collected some outstanding specimens of caledonite. I saw Steve prior to the show and picked up a few of these and one spectacular TN in particular which sold immediately. Fantastic specimen of caledonite from the Reward Mine. The above specimen of caledonite from the Reward Mine. A vug lined with deep blue caledonite. The yellow arrow points to a leadhillite crystal. Things are changing for the Denver mineral experience. Marty Zinn has sold his show and the new organizer is moving it from the Ramada Inn to the Crown Plaza hotel on the east end of town. It will be quite a drive from Golden where Dave Waisman's show is to this new one. It will also put a strain on several dealers who do all three venues or even just two of them. There is even word that Marty Zinn will be selling in one of the rooms at this new venue next year. The one thing we can always count on in life is change! My last installment for Denver 2016 will be the displays that were here. Wow there were some good specimens on display this year!